True, Putin and/or his advisors have intuited the political power of nostalgia in a country where the vast majority of people had been ripped off by the advent of liberal democracy. But the trite proposition whereby Putin has brought back the totalitarian darkness of Soviet times hardly makes sense in a country that, before the October Revolution, had been run by the same family for 300 years. If we don’t consider the experimental decade that followed 1917, it is safe to say that Russia hasn’t seen a single day of political freedom throughout its history. To imply that Yeltsin’s Russia was an even remotely democratic society is an insult to the millions of people who died during his presidency (Russia’s “excess mortality” in the 1992-98 period alone exceeded 3 million deaths). But Mansky keeps dwelling on the behavioural aspects of Putin himself, as if cracking his psychology would somehow reveal the nature of his dictatorial power, which, alas, by the end of the film remains as vague and inscrutable as it was at the beginning. 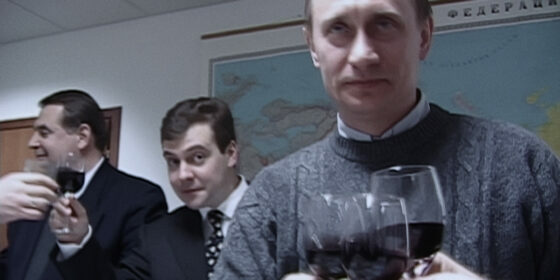 When Mansky films the celebrations in the campaign office, there is a member of Putin’s inner circle who the director falsely claims has since switched to the opposition who remains almost relegated to the background. Despite having never taken centre stage, over the last 25 years Anatoly Chubais has been a pivotal figure in the radical transformation of the Russian economy. From his close collaboration with the Harvard Institute for International Development in the early ’90s to his 2008 appointment in the Advisory Council for JPMorgan Chase, Chubais has shaped contemporary Russian economics and, arguably, society more than many other, better-known figures. One cannot help but wonder if understanding people like him would be of greater help when filmmakers try to solve the riddle of Putin’s criminal ascendancy.